UNDER A CRYSTAL CLEAR NIGHT SKY, I stepped out of the Owl Research Institute (ORI) fieldhouse — not far from the little town of St. Ignatius, Montana, on the edge of the Ninepipe National Wildlife Refuge — to gaze at the stars. To my left, a great horned owl hooted in the darkness. Another replied from a different direction. I named constellations in my head and considered how appropriate it was to be surrounded by owls while visiting one of the premier owl experts in the world. Denver Holt founded the ORI on the Flathead Indian Reservation in Western Montana more than 25 years ago, and he couldn’t have picked a more appropriate place. Montana claims 15 species of owls — more than any other state. Eleven species breed in the Mission Valley alone. After my night at the fieldhouse — a compound of buildings with overnight accommodations, offices, and teaching spaces — I drove behind Holt from Charlo to Missoula where we picked up ORI researcher Matt Larson and volunteer Andrea Darling. Everyone was dressed in Carhartt jackets and warm hats, ready for a day in the field. Larson has worked for ORI since 2008, and, like Holt, is involved in public speaking, natural history guiding, and writing scientific papers. Darling began volunteering for the organization after she had called them about owl nests on her property. Our group parked on private property at the end of a dirt road just outside of Missoula. The property owner had given permission for us to poke around, looking for owls. I hopped out of the rig and stepped carefully over a barbed wire fence. In front of us was a dense thicket of willows with patches of snow on the ground. We pushed through the tangle of leafless branches to make our way toward an opening in the middle. Larson and Darling flanked the thicket, eyes keen for camouflaged birds. I couldn’t see anything at all, but they quickly spotted several long-eared owls tucked away in the willows. Holt came in behind us after instructing Darling on where to set up the nets. We were ready to go about the business of owls. Holt has published nearly 100 technical documents and papers, including three species accounts for the Birds of North America project. He was also team leader for the Strigidae owl family species accounts for Handbook of the Birds of the World. In 2006, he authored a chapter on owls for the book Arctic Wings. He’s had numerous appearances in National Geographic and more television credits than you can count, including PBS’s “Bird Watch” and David Attenborough’s “Life of Birds.” Recently, his snowy owl research was the focus of a BBC documentary series, “Frozen Planet.” The New York Times featured a story on Holt’s long-term research on long-eared and snowy owls. The list of accolades, scholarly articles, and media features goes on and on. But none of this was planned. 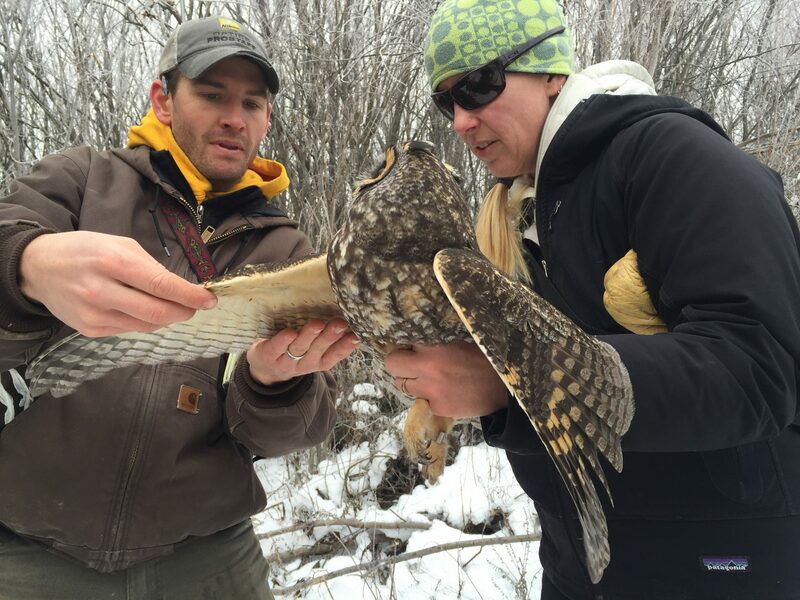 Holt fell into owl research while working on a wildlife degree at the University of Montana. A friend found an owl nest north of the university in the Rattlesnake area, and Holt and another friend started keeping an eye on the it. That was the beginning of an obsession. Holt believes that long-term field studies are the primary means to understanding trends in natural history. “I started out just saying, ‘I think I’ll study these guys,’” Holt said. 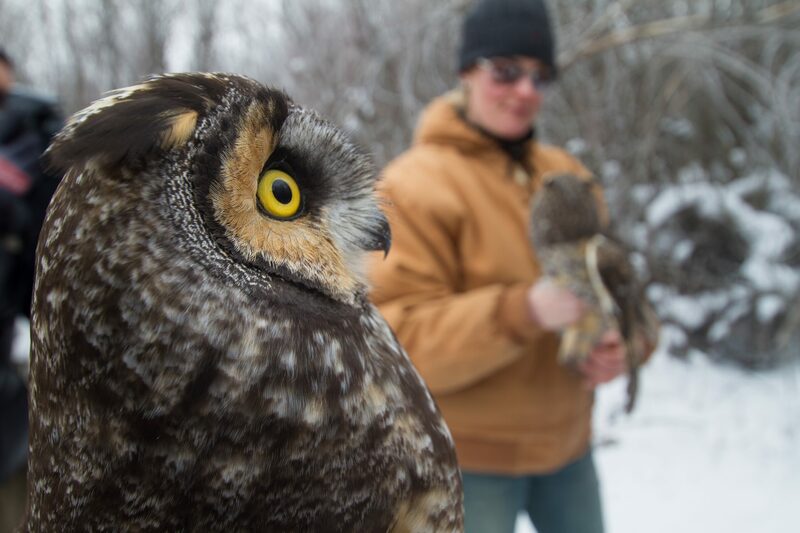 And now this year, ORI is celebrating the 30th anniversary of their long-eared owl study, the longest running, year-round research project on this species in North America. It’s also the 25th anniversary of their snowy owl study, the longest running breeding study in North America, and the second longest in the world. Holt and Larson, and in the past other researchers, spend more than one month each summer in Barrow, Alaska, monitoring snowy owl nests and chicks for up to 14 hours a day. As with his other projects, Holt is interested in long-term trends in the snowy owl population. They count nests, record egg-laying dates, and clutch numbers. After the chicks are born and big enough, the researchers band birds and monitor survival rates. Holt and Larson check back on the nests every day, sometimes walking 15 miles across the tundra, to keep track of growth, survival, and what the owls are eating. The trend for long-eared owls is down too, according to Holt. What they know, based on the studies, is that both long-eared and snowy owl populations are declining in their study areas. What they don’t know is why. “Everyone blames development for the decline in long-eared owls, but their habitat is expanding in the Mission Valley and numbers are still going down,” Holt said. ORI has banded over 1,800 individual long-eared owls and found more than 220 nests during the course of their study. The original question was whether the communal breeding roosts were made up of related individuals. They aren’t. “In fact,” Holt said, “it is very rare to find any related individuals.” And while they find owls roosting on the same branches from year to year, they are different owls each time. From that first question sprang many others. ORI looked at clutch size, hatching and fledgling success, food habits, nest site characteristics, molt, and migration. They’ve done DNA and other molecular studies. They’ve quantified stress hormones, allowing them to evaluate the impact of research on the owls. In addition to the long-eared and snowy owl projects, ORI is busy with eight other research studies. Since 1981, ORI has surveyed northern pygmy owls and studied their nesting habitat in snags and tree cavities. ORI has searched for and monitored boreal owl nests since 1982. Both owls are listed as “sensitive” by the Confederated Salish and Kootenai Tribes’ Wildlife Management Program. Like all owl species, surprisingly little is known about them. After checking for a bird band on the owl’s leg, Matt Larson measures the length of the owl’s wings. After verifying that there were owls in our willows, the ORI crew set up two mist nets, 8 feet tall and about 15 feet long, specially designed for catching birds safely. Larson stood quietly in the bushes near the nets while Holt and Darling circled the thicket and waved their arms. On the first attempt, three long-eared owls flew right into the net. Larson quickly and gingerly untangled them. As each one was freed, he pressed its wings closed with one hand and passed it along. The large female he gave me was surprisingly warm. I kept my fingers intertwined with her legs, as instructed by Larson, and pressed her soft wings to her body when she started to flap them. The owl’s feathers ranged in color from gray to dark brown to cream. Holt had said that people are drawn into the eyes of the owl, and he was right. Her bright, unblinking, yellow eyes mesmerized me a little, and definitely captured my heart. Named after its prominent “ear” tufts — really feathers to aid in camouflage — the long-eared owl is medium-sized, typically no more than 16 inches long and with a wingspan of 39 inches at the most. It looks like a slimmer version of a great horned owl. As we held the birds, Larson checked for bird bands (tiny metal bracelets on the owls’ legs with identification numbers), measured wing length, weighed the birds, approximated their ages, and entered all the information into a field notebook. The three owls had already been banded, and the group recognized the largest female as one they had captured a couple of times before. After all the measurements were taken and entered, we quietly released the owls back into the willows. I lifted the bird above my head and simply opened my hand. It flew to a nearby perch. For his part, Holt plans on continuing the long-term studies. He believes they are reaching milestones in the research, but there is still work to be done, both on the research and the education ends. Holt just returned from speaking at the Murie Science and Learning Center in Denali National Park, and guiding a bird-focused natural history tour in Norway. “It’s just been busy as heck,” he told me. It doesn’t look like things will slow down any time soon for this man on a mission. After catching owls in the willow thicket, we gathered at a pub in downtown Missoula for a late lunch and celebratory drinks. I was still a little high from holding an owl. Holt and Larson talked about their work and their plans to continue studying long-eared and snowy owls, as well as other owls, for as long as they can. They emphasized the importance of long-term studies once again.